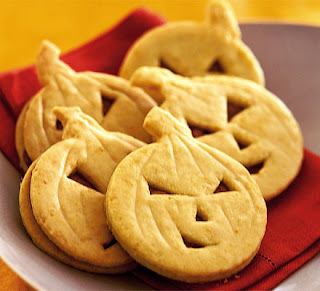 Halloween costumes and cookies......oh my! We are back on French shores at last, just couldn't delay our departure from Hilton Head any longer, although we gave it our best shot. Once we had said farewell to the house sitter I sat down with a cuppa (tea, milk no sugar) to sift through the post (mail) that had accumulated whilst we were gone and discovered a note from the local maire telling me that the children of the village would be arriving in 3 hours for the annual Trick or Treat bonanza. This usually happens on the Wednesday before Halloween as this is not a school day. Because we are a tiny hamlet, 94 residents living in 47 houses but quite spread out, the parents accompany the children driving them from house to house. Quelle horreur!! There was not a stick of candy in the house so we jumped in the car and headed to the local epicerie to raid the shelves. We made quite a haul but when it came to pay I discovered that I had brought the wrong wallet and had only $$$$ with me. Not a problem, Madame said it was quite alright and that I could settle the bill in a couple of days when I was over my jet lag. Back home again I quickly prepared a basket with a Halloween theme, donned my witches hat Mr B placed his red devil's horns on his head, I tied Mr Ben's pumpkin ears (deeley boppers) around his chin and we were all set. See Mr B on the end with the basket? 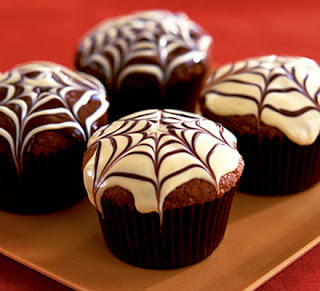 If only I had had a bit more notice I would have made these fabulous Orange Pumpkin Face Cookies or these Spider web chocolate fudge muffins for our visitors. Head over to Designs by Gollum for more Foodie Friday treats and eats. Whilst still in HH we went one evening to an event called the Pumpkin Patch which was held at the Community Park at Shelter Cove. Shannon Tanner is a Hilton Head legend and has been performing his Harbourfest Show every summer for the past 22 years at Shelter Cove Harbour. We first saw him there about 17 years ago and it was great to see him again on stage at the Pumpkin Patch, doing what he does best, entertaining families and also judging the childrens Halloween Fancy Dress Competition. 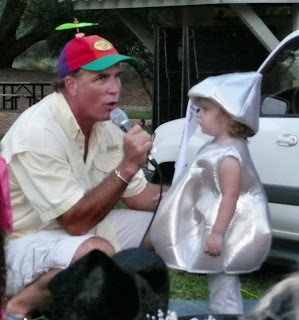 and this little Hershey's Kiss won first prize. One last thing...........don't miss the great 100th post giveaway happening tomorrow on my other blog Quimper Club International. Click here to read about the prizes and here to leave a comment on the 100th post to participate in the draw. Or simply click on the giveaway button at the top of the sidebar to go to the QCI Blog and read all about the fabulous 10th Annual meeting that took place in Dallas, TX last week. Happy Halloween wherever you are! 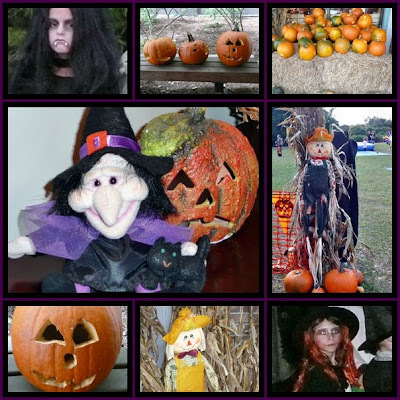 It's Outdoor Wednesday over at Susan's A Southern Daydreamer and she has asked that today we submit our Halloween pix but all I have is the one in my new header taken by my brother in law Andrew. That's me wearing orange and the pointy hat, the pretty witch is the middle is my sister KE, the lady on the end, my step mum Joyce and the ghost & skeleton are AJ & Big Nic our nephews. The photo was taken two years ago when the family came to Normandy to celebrate my Dad's 80th birthday which was October 31st, Halloween! 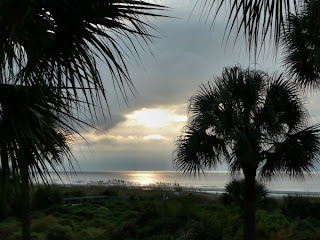 As most of you will know by now I have been languishing by the sea in beautiful South Carolina for almost 2 weeks now. 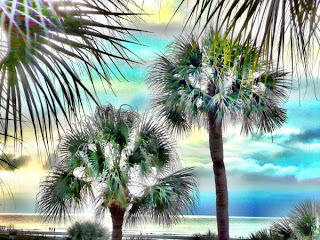 You may also be a little tired of seeing palm trees and beach scenes, but guess what, I'm not! 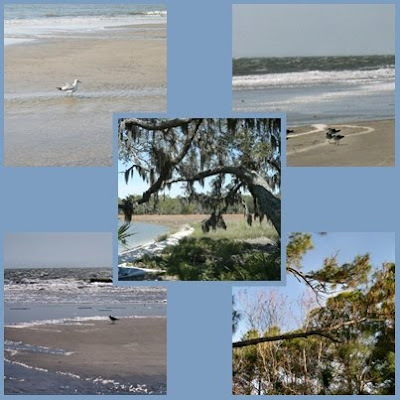 I just can't help looking at the scenery, so in case the weather is not so fine where you are today and I know that some of you have frosty mornings and even snow by now, come take a walk on the beach in Hilton Head with me. 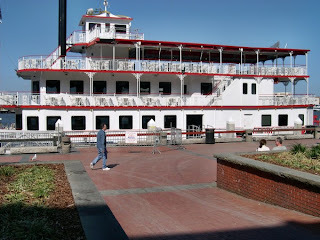 This time next year, October 2010, we will be here, once again, getting ready to host the 11th Annual meeting of the QCI in Savannah, Georgia. Some of our members have been concerned about hurricane weather here in South at that time of year and whilst of course I wouldn't be foolish enough to say that there will not be a hurricane before or during the meeting, this is probably what you should expect. Maybe I'll have some Halloween pix next week after I return to France and the village kids come around for Trick or Treat, I'll try! 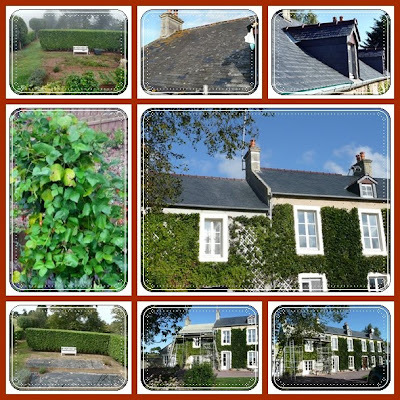 It's Monday so that means just one thing it's Mosaic Monday over at Mary's Little Red House. 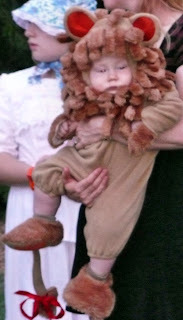 Also, I hope that we'll get some visitors from Sharon's Halloween Bash at Fiberdoodles & Whimsy, what a great idea this is! Please take the time to visit both of these ladies and join in the fun. So, we're staying at the beach and there's not too much Halloweeny stuff to show down here but I did find some. I went to Michaels last week and bought some Fall decorating bits and bobs, I've played around with them and decorated the condo a little bit. 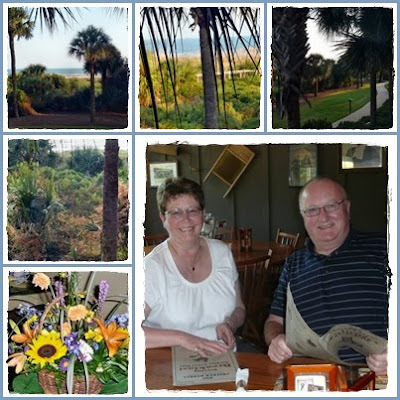 When staying in HHI we love to shop at the Fresh Market and whilst there I always sample the delicious coffee which they set out for their customers to enjoy. At the moment they have a Decaffeinated Pumpkin Spice coffee "with the rich flavor of pumpkin, cinnamon and allspice". We usually take our coffee black & strong but this pumpkin spice taste is "nice for a change" to quote Mr B. 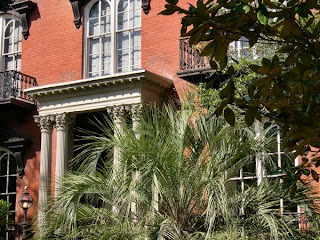 A few days ago we visited Savannah to have lunch at the famous "Mrs Wilkes' Boarding House" (but that's another story!). 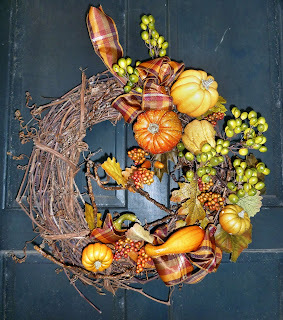 Mr B photographed these beautiful Fall wreaths decorating the front doors of two homes just across the street from Mrs Wilkes'. Savannah is reputed to be America's Most Haunted City but there were no ghosts to be seen in the bright sunshine. I'm not sure if I'm ready to go back for an evening Ghost Tour, maybe next year when we host the Quimper Club's 11th Annual Meeting there? 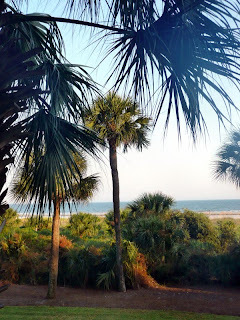 It's 3 or more Tuesday over at Tam's The Gypsys Corner again and before I go walking on the beach this morning I thought you might like enjoy a peek at some of HHI finest palm trees? This guy is right alongside my balcony. I took this last night before the rain came down. Y'all come back now, but not before you check out what's happening over at Tam's place. 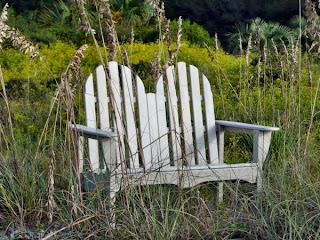 Mosaic Monday from Hilton Head Island, SC. 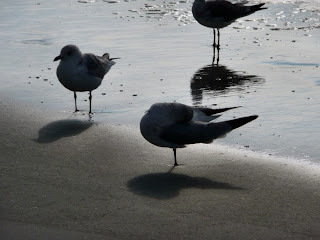 I Saw From the Beach by Thomas Moore. 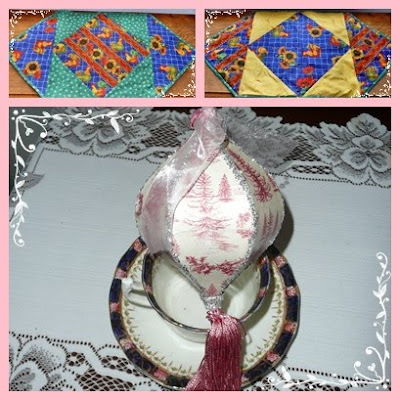 It's Mosaic Monday over at Mary's Little Red House. 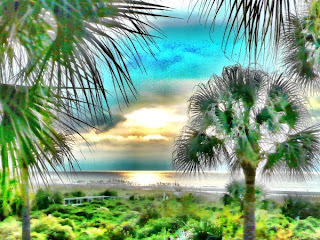 The weather here in Hilton Head, SC is glorious, so wonderfully warm. 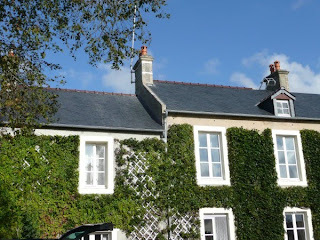 After a so so summer in Normandy we are basking in the sunshine, reflecting and remembering the good times. Soon after we arrived so did a welcome basket from "management" and a wonderful Autumnal floral arrangement from our friends Tony & Jan in the UK. Tony was Roger's best man all those years ago (30) when we said our marriage vows and remains a close friend to this day. Happy Mosaic Monday everyone, be sure to visit Mary @littleredhouse. "If you would like to participate in Pay It Forward, just leave a comment on this post. The first three people to leave a comment will be my next Pay It Forward recipients. You must have a blog so I can read your postings and learn a little about you. That way, I will know what to make just for you! THEN, when you receive your package from me, you post pictures of what you received, just as I have done, then add the Pay It Forward button (which is at the TOP of this post) to your post, and wait for three comments on your blog...and the game continues on. If there are any questions you can ask me anytime! It really is a whole lot of fun! Let's see how far this PAY IT FORWARD can continue." I decided to post a comment and was lucky enough to be included as a participant. Yesterday, I received a wonderful surprise. A box from Campagne Maison was delivered and inside it a wonderful handmade table topper with Roosters (!) and a precious pink and white Christmas tree decoration, complete with tassel. So.................my dears, I am Paying It Forward following the same rules as described above, the only difference being that I cannot promise that what you receive will have been created by my fair hand. Oh, and one more thing........as you may already know I am counting down the days to my upcoming vacation, but I'll be sure to have your cadeux on it's way when I return home. On y va, let's just see how far across the world we can take this. BTW, some of the comments that have been left have asked not to be included in the PIF, so please do leave a comment if you would like to participate. 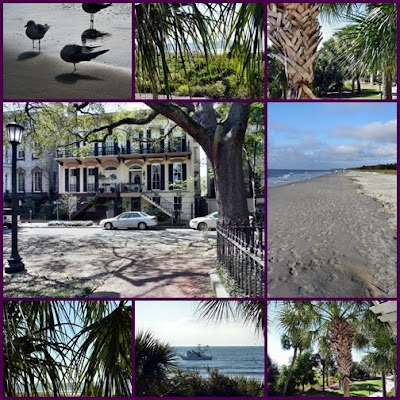 The bags are almost packed for our trip and the house sitters are poised to move in and take care of Mr Ben, but before I jet off to the peaceful shores of South Carolina I have to bring you up to date on what's been happening here at Le Presbytere. 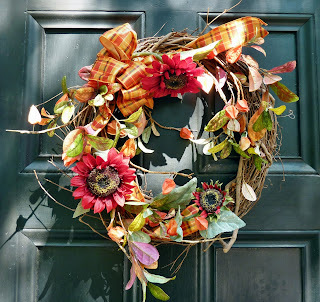 I'm linking up with Mary @Little Red House for Mosaic Monday and also Susan @ Between Naps on the Porch for her Metamorphosis Monday gathering. Please do visit both of these wonderful ladies who graciously give up their time to arrange these get togethers for us all. 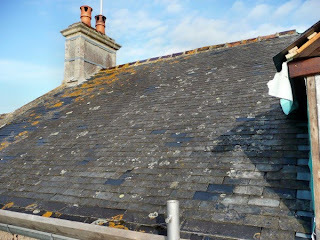 As some of you may know this was the summer we decided to go for it and completely replace the old roof, it took longer than anticipated but these big jobs often do. 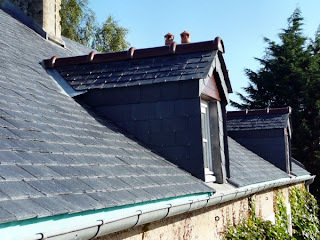 However, Rory the roofer didn't uncover too many horrors up there and we are very happy with the finished product. Looks spiffy now doesn't it? Last week S the G worked like a Trojan in the potager, clearing out the old dying vegetables and weeds, then laying down the thick black plastic topping that will keep those weeds at bay during the winter and help the soil to warm up next spring. Is this a metamorphosis in reverse? I'm not quite sure but I'm happy every thing is cleared away for the winter. We kept the blueberry bushes, the lavender & thyme plants and a few beetroots that may still be edible. 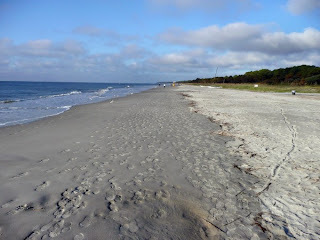 The next blog I write will be from across the pond. October 1st, It's Fall Y'all. 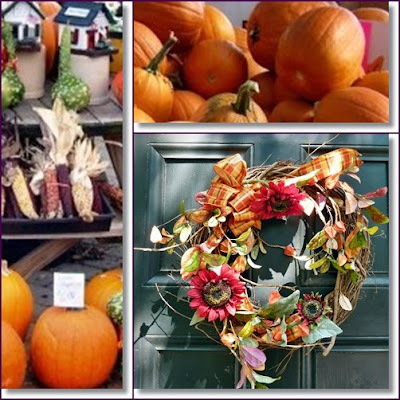 I've been seeing so many beautiful photos and ideas for Fall decorating that I was inspired to put a few things together myself. 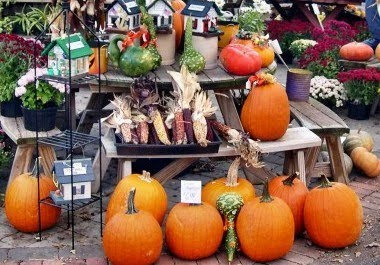 So, I'm linking this post to Rhoda's It's Fall Y'all party @ Southern Hospitality and also to the Plant Some Roots giveaway @ Life at Lakewood . I bought this chest of drawers at the Auction House in Bayeux about 12 years ago, refinished it and placed it in the entrance hall with a mirror above, which I also found at the Auction House, a few months later. I stood a plain glass hurricane lamp shaped vase on a pewter tray and filled it with an ivory coloured candle and horsechestnuts which fell from a tree, onto the grass in the back garden. 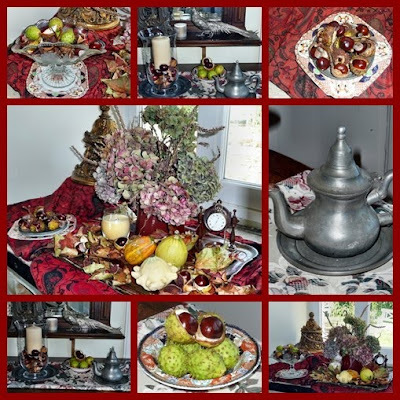 Placed a few more horsechestnuts, still with their green prickly cases, in a small English porcelain dish by Wood & Son, added a pair of silver plated pheasants and etched glass votives either side of an Art Deco bronze clock and an antique French pewter coffee pot on a small pewter plate. I made the table runner from a piece of material left over from the Library curtains. In the dining room window alcove I placed a shabby chic, red, gold and black papier mache tray which I found at a vide grenier about 7 years ago, and covered it with a deep orangey red and black paisley patterned fringed shawl. On the tray I placed a vintage red enamel French coffee pot and filled it with some of the last hydrangea blooms from the garden and some bits and pieces from the fields and hederows. 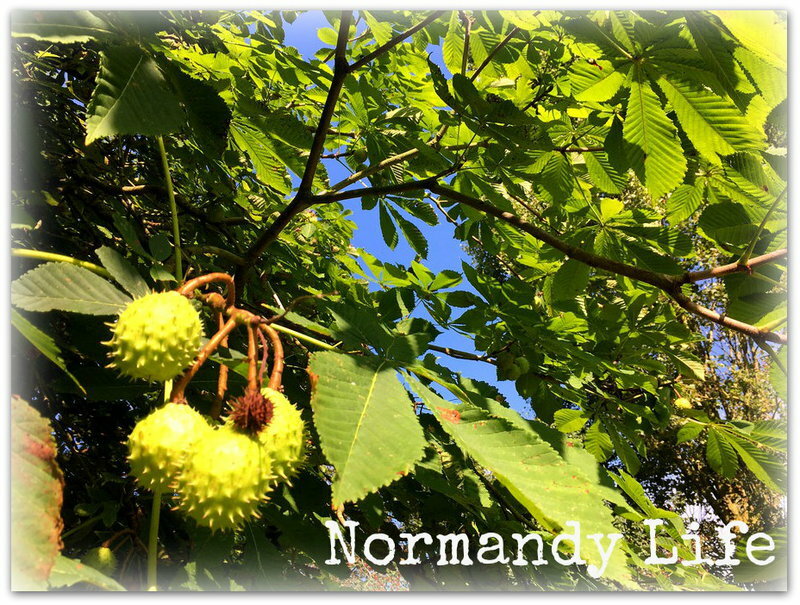 I scattered leaves and conkers from the horsechestnut tree and some acorns too, around three knobbly colourful mini gourds which caught my eye at the produce market in Le Molay Littry recently. A scented candle in a glass jar, for it's exquisite vanilla scent, an ornate, gilded, rococo wall sconce, placed upside down for interest at the back and an heirloom pocket watch and chain on a wooden stand and my vignette was complete. A close up of more horsechestnuts in a vintage French pressed glass dish, standing on a Carlisle Ware plate, Burgess Bros, England. When we return from our US trip, later this month, I should just have enough time for some Halloween displays, I hope. Labels: Fall, Gourds, Horsechestnuts, Pewter.